A pattern I use when building Web APIs is to create commands to represent an API operation and models to represent resources or results. 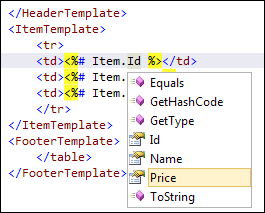 We share these "common" objects with our .NET client so we can be sure we're using the same parameters names/types. This provides a single place to encapsulate our default values and validation rules, keeping our controllers nice and lean. 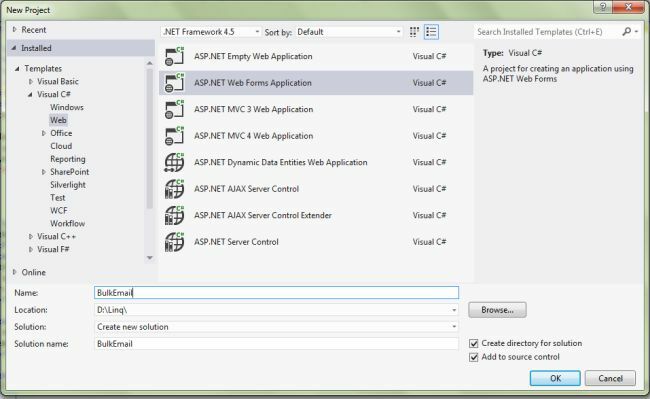 To bind complex types to query strings in ASP.NET Web API we had to change the parameter binding rules. This is because the default was to bind complex types from the HTTP Request body. I thought that perhaps the framework detected that this was a HTTP GET request and therefore bound the parameter values from the query string instead. This seems an odd default given that (in my experience) binding complex types from the request body is far more common. This convention checks to see if the parameter type implements ICommand (a marker interface I created) and if so, instructs the framework to bind the values for this parameter from the request body. This is the first part of the series of articles I'll be covering about ASP.NET Core Security. We're going to start off with cookie based authentication and build our way up to configuring policy based authorization. As part of the ASP.NET Core security, there is a new richer policy based authorization that we can use to authorize against the claims in user's possession. 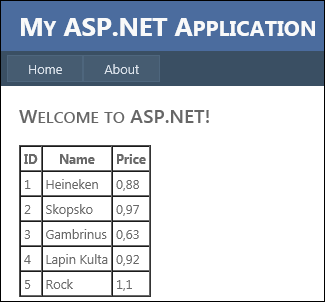 Let's build an example MVC application to demonstrate the concepts. In our scenario, we'll demand users to be authenticated and have Read claim to view the home page of our application. I am using Visual Studio 2015 Pro Edition w/Update 3 (you should also be able to use the free community edition). 3. We need to add the required nuget packages to configure authorization, cookie authentication, and the mvc middleware. Bring up the project.jsonfile, add the following under the dependencies section. 4. Once you save the project.json file, Notice Visual Studio installs the missing nuget packages automatically. Next, bring up the Startup.cs where we'll configure the middleware we just included in our project. Here we're using the Cookie authentication, defining our LoginPath, where users will be redirected for authentication, and AccessDeniedPath when the user is not authorized. AutomaticAuthenticate flag indicates that the middleware should run on every request and attempt to validate and reconstruct any serialized principal it created. AutomaticChallenge flag indicates that the middleware should redirect the browser to the LoginPath or the AccessDeniedPath when the authorization fails (there are various other configuration options, however this the bare minimum we need for this example). Next, we'll configure the requirements for the ReadPolicy. The policy will demand the user to be authenticated and have the Read claim in order access the required resource(s). Depending on your authorization logic, you can setup your policy to require additional claims. 6. Finally we need to add the mvc middleware configuration. Let's add couple of controllers so that we can test the login and the policy we've created. Create AccountController for user login and HomeController where we'll apply the ReadPolicy. 8. Add a simple Login.cshtml view under the Views/Account folder (create the folder structure if it doesn't exists) where the user can login to the application. In the POST login action, we have a simple verification; The username and the password must match in order to authenticate the user (Obviously you wouldn't do this in a real production application but for our demo purposes this is fine). If they match, we then create a set of claims, the claims identity, and the claims principle that represents the authenticated user. Then, we sign in the user (means we issue a cookie to the user which contains the set of claims we've created) and redirect back to the resource that was requested for access. Note that we passed the ReadPolicy to the authorization attribute. The user must be authenticated and have a Read claim to have access. Otherwise, they'll be forwarded to the Forbidden page as we specified in the authentication middleware configuration. We should be able to test our changes at this point. Once you run the application, you'll be redirected to the login page since you're not authenticated (notice the return url in the query string is set automatically by the framework). Upon successfully submitting your credentials, you will be authorized and redirected to the home page. For testing purposes, try removing the Read claim we've added in the Loginaction, rebuild your solution and restart the application, even if the user can login successfully, authorization will be denied and the user will be redirected to the Forbidden page. LINQ to Entity is a great ORM for querying and managing databases. There are some points that we should consider while designing and querying databases using the Entity Framework ORM. While working with Entity Framework, view generation may take longer for a large and complicated model. We can use a pre-generated view to save run time cost to generate a view for the first request of a page. A Model Generated view helps us to improve start-up performance at run time. Avoid use of the contain keyword with a LINQ - Entity Query. While Entity Framework generates equivalent SQL, the contain is converted in the "WHERE IN" clause. The "IN" clause has performance issues. 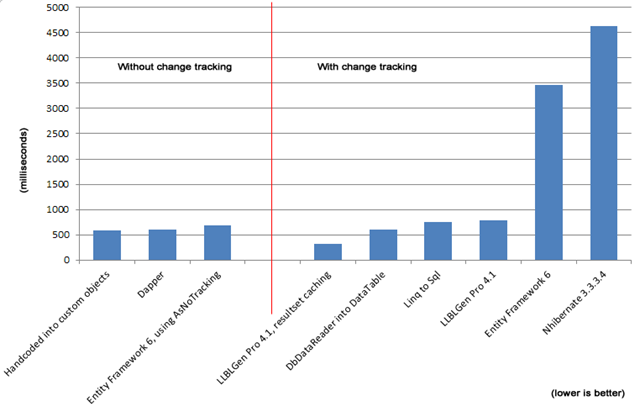 Views degrade the LINQ query performance. So avoid using views in LINQ to Entities. If you are using Entity Framework 4.1 and below, you must use a compiled query. The Compiled Query class provides compilation and caching of queries for reuse. The Entity Framework 5.0 supports a new feature called Auto-Compiled LINQ Queries. With EF 5.0, LINQ to Entity queries are compiled automatically and placed in EF's query cache, when executed. When we are investigating performance issues, sometimes it's helpful to know the exact SQL command text that the Entity Framework is sending to the database. I would suggest that we must examine each and every LINQ to Entity queries to avoiding performance issues. Entity Framework supports the loading of related data. The Include method helps us load relevant data. Use of the Include method ensures it is really required for the page i.e. do not include a navigation property whenever it is not really required. Entity Framework supports three ways to load related data: eager loading, lazy loading and explicit loading. Eager loading is the process in which a query of one type of entity also loads related entities as part of the query. Eager loading is done by use of the Include method. Lazy loading is the process in which an entity or collection of entities is automatically loaded from the database the first time that a property referring to the entity/entities is accessed. When lazy loading disabled, it is possible to lazily load related entities with use of the Load method on the related entity's entry. It is called explicit loading. So depending upon on the type of application and requirement we can select appropriate Loading type for the entity model. Using the above definition tips, we can definitely improve the performance of LINQ to Entity Queries. Hope above tutorial help you. This Article will tell you how to faster loading of your ASP Pages and make the performance better, If you read the internet and all of the websites dedicated to Asp.Net you will inevitably read about the wonders of the DataGrid, DataList, and Repeater controls. While each of these has its place, if you are only displaying data there is a much faster and more efficient means to do so. Let's say you have a page that displays articles based on a query string. A normal asp page execution procedure goes like this. The code queries the database based on the Article I.D. and then brings back that information to the page where you display it in the fashion that you would like. This is a fairly straight forward approach with asp and is done all the time. Check The Easy Step Below! This is a no-brainer, and I won't go into the brilliance or details of asp.net caching here because at the time of this writing Google has 2,780,000 articles on the topic. Basically instead of querying the database each time the page is loaded you only query the database once and load that result into the system cache. Subsequent calls to load the page retrieve the data from the cache as opposed to the database which gives you an instant and considerable performance boost. You can then set the cache for how long the cache should store the information as well as many other features. If you are not using the cache, you should be whenever possible! 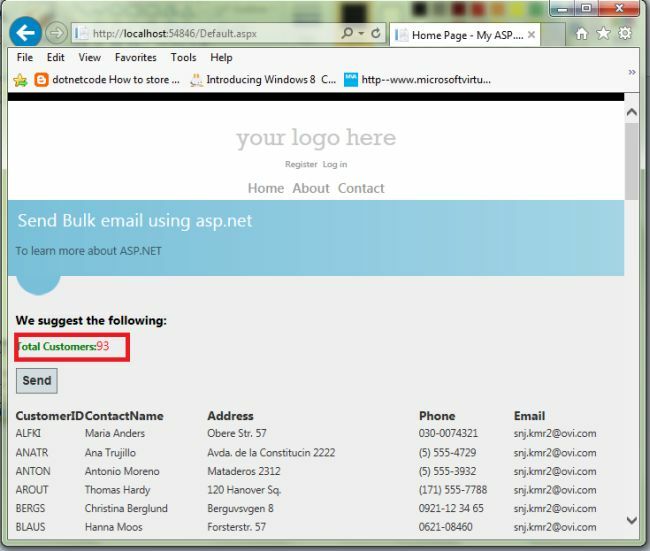 If possible, do NOT use the standard Asp.Net controls. That's right. The standard asp.net controls are designed for rapid development and not page performance. They allow you to design pages that grab and display data very quickly but their actual performance suffers because of the extra overhead which is there for ease and speed of development time and not page execution speed. Instead, create either a User Control or even better yet a Web Custom Control which is by far the fastest performance wise and really quite easy to create and use. Use an SqlDataReader or even better yet use a set based command for Sql Server data retrieval and simply execute that one command against the database. An asp.net SqlDataReader is a fast forward only datareader that closes the connection after it reads the last set of results. Now for my article pages we are only returning 1 particular result. In this case we would opt for the set based command. If you had more than 1 result returned, in your table of contents for instance, you would use the SqlDataReader because you are returning multiple sets of results. We can write it using a set based command like this. Use Classes and ArrayLists as opposed to returning an SqlDataReader. Create a class and then if there are more than one set of results store those results into individual instantiations of that class. Finally store each of those classes into an ArrayList. You can then store only that ArrayList into the asp.net cache. So instead of getting the results back from a SqlDataReader when loading your page you get them from the ArrayList which is stored in the cache. On the first time the page loads, query the database and return all of your data storing it into individual classes. Then store each of those classes into an ArrayList. If you only have one single result you may store only the class into the cache. Then take your ArrayList and store it into the cache. Next create a Web Custom Control and pass the cached ArrayList to the custom control and loop out your data using the HtmlTextWriter which is very fast. Remember each subsequent call to load the page will be called from the cache which stores your ArraList of classes or your single class. Certainly it takes a significant amount of additional coding to do it in this fashion, especially when you take proper error handling into consideration, but if you follow this approach your pages will be screeching fast, you will immediately notice the difference, and your asp.net pages will execute in the proper sequence - Data handling in the Page_Load function and the html display in the Page_Render function. 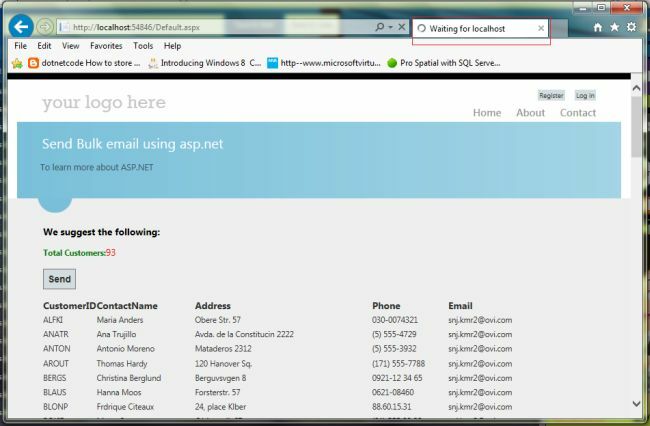 Create a new project using "File" -> "New" -> "Project..." then select web "ASP .Net Web Forms Application". Name it " Bulk Email". See the following screen for the Default.aspx: Total Customers data bind. Now, see the following screen for the Default.aspx: send email waiting. 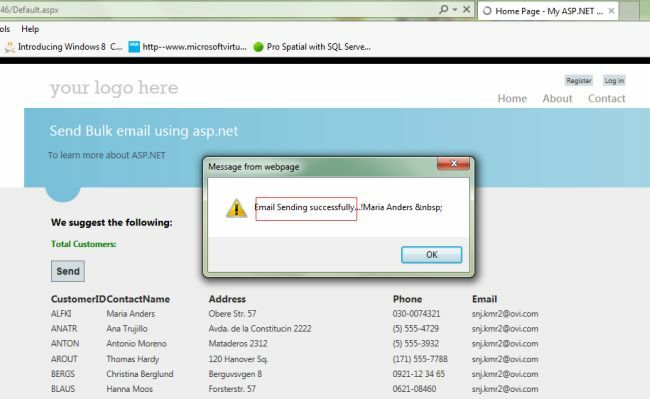 Now, show in the Message box “Email sending successfully”. Now "Email Account Open" - > "View Email". You’ll see the messages on your inbox. 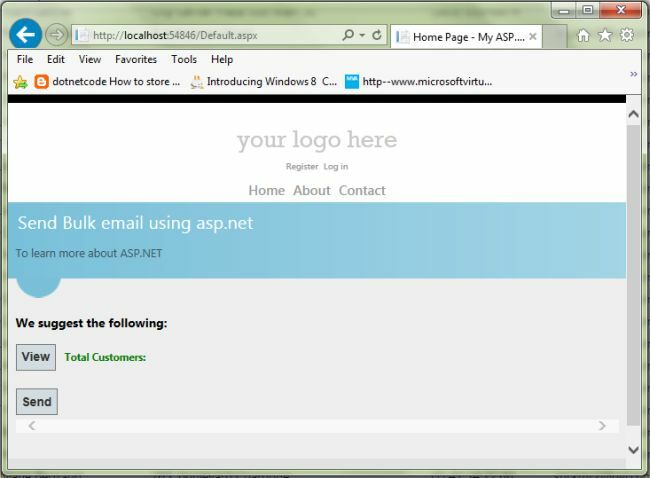 Bulk Sending an E-Mail Using ASP.NET 4.5 with HTML Email Templates and Gmail SMTP Mail Server. I hope this article is useful. “ArgumentException: The specified string is not in the form required for a subject“. So what is exactly “the form required for a subject”? Googling for this error message returns a lot of junk and misinformed forum posts. It turns out that setting the Subject on a System.Net.Mail.Message internally calls MailBnfHelper.HasCROrLF (thank you Reflector) which does exactly what it says on the tin. Therefore one forum poster’s solution of subject.Replace("\r\n", " ") isn’t going to work when you have either a carriage returnor line feed in there. Personally, I think that the MailMessage should to this for you or at least Microsoft should document what actually constitutes a “form required for a subject” in MSDN or, even better, in the actual error message itself! You’re trying to increase session timeout on your ASP.NET site? In this tutorial, I will gonna talk about this issue. But, if you use shared hosting, you cant use session as it will impact to other clients site. Usually, the first and easiest thing to do is just change the configuration/system.web/sessionState@timeout value to something like “90″. This should mean that you’d like your users’ sessions to be persisted until a 90 minute window of idle time has elapsed. Hmm… Not only about change on your code, but please check this application pool timeout on your IIS setting. Ensure this value is set to the timeout of your session, at a minimum, to ensure that all sessions persist for the entire session timeout period. The reason that these two values are dependent on one another is because the session information is actually stored within the worker process of the application pool. That is to say, if the worker process is shutdown or killed for any reason, the session information will be lost. The only mode that is vulnerable to losing session information on a worker process is when the state is stored in the worker process. Both StateServer and SQLServer modes are not affected by worker process resets. Likewise, StateServer and SQLServer modes are the only options when it is necessary to share session state across more than a single IIS server. For more information about these modes, check out MSDN. There’s two ways to change the session timeout when you’re dealing with classic ASP. You can set it at the application level, or programmatically, which means that the value can be different within the application. Since it doesn’t specifically state that the setting is for classic ASP, it may be confusing to know that the value is in: Application Properties -> Configuration… -> Options -> Enable session state. It’s as simple as updating this value, and the session timeout for your entire classic ASP application is changed! You can also use modify the Session.Timeout property at runtime to affect the timeout period of the session. One popular location to put this piece of code is in the global.asa file.